I miss the fresh smell of warm poopie in the morning. It feels like yesterday that I’d pull those diaper straps down and unfold a lovely brown (or blue, or green, or even mustard) pile of pure aromatic wonderment. I miss the feel of a ripe turdling through the moist bum wipe cloth. Oh, and the unanswered questions I’d have for myself after the changeup. “Where’s that smell coming from? Did I miss a spot? How did I get dirt under my fingernail when I haven’t been outside?” Those experiences are almost gone between Worm and I. As beautiful as it sounds, there is no joy in changing a diaper. Until your kid is being potty trained. Then you realize the convenience of that uber-absorbant miracle piece of ingenuity between your baby’s legs. 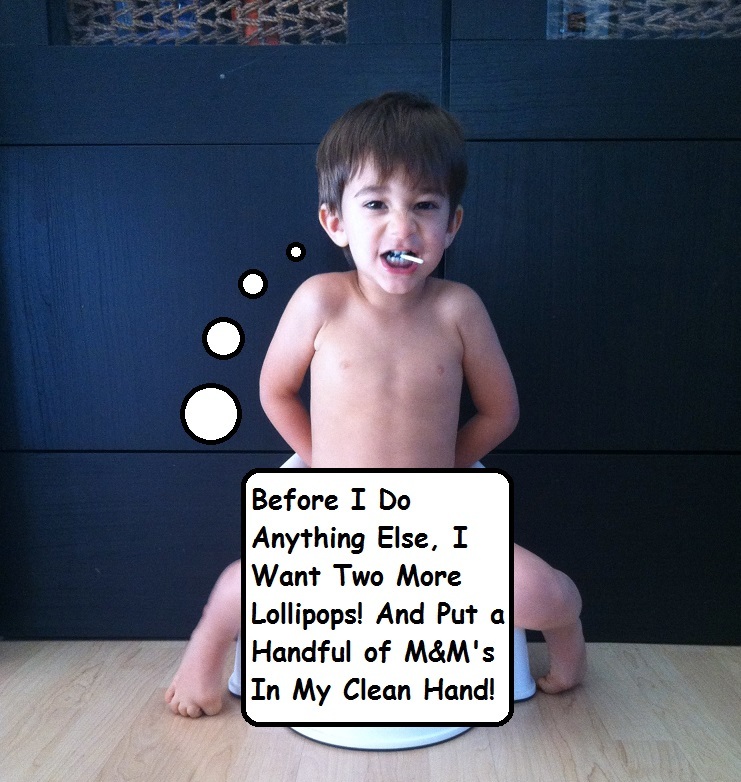 I was under the impression that potty training was the way to go. Over two months ago, the wife and I started out by enticing the Worm to use the big toilet by trading toys for turds. That worked for a few weeks and the novelty wore off. We moved to the popular M&M method. Two for pee pees, five for poopies, seven for anything over a foot long. That also lasted a few weeks. The training technique that worked for us ended up being the strong arm method. Worm hasn’t had an accident for over a month now. Yeah, he wears diapers at nap time and bed time just in case. Though, they haven’t been necessary. Also, Worm’s been so compliant with using the toiled at school, the teachers have recommended that he wear underwear instead of pull-ups. We all know that performing (as if it’s like tightrope walking or juggling) number 1 or number 2 requires the body to be in a somewhat relaxed state. Well, when is Worm relaxed? Around nap and bed times. So what does that translate to? Awesome. There goes my beauty sleep. The yelling also wakes up Mushie and the dogs. Now everyone’s up and making noises. Awesome. And then we get to start the nap time routine all over again. Awesome. Now he actually falls asleep somewhere between 9:30 and 10pm. Hooray for potty training. Right now, I’d trade a couple of diapers for the 3 hours of additional potty effort every day. When do the benefits of it all start to kick in again? This post was going to be about a neglected little potty that spent its entire life collecting dust in the corner of the kitchen. And one day, all of that changed. I’m not sure what got into his head, but the Worm was so excited to use the potty last week, he almost peed himself. The lithe leprechaun became giddy, arms (and other appendages) flapping about as he hurdled the couch cushions and zipped through the air in unclothed hysteria. I gave chase, holding a clean diaper and hoping to catch any pee or poo that could escape Worm’s little body should he laugh a wee (literally) too hard. Ten minutes in, I was exhausted. The only real solution was to break out the potty, pitch it to Worm like a used car salesman, and hope he would take to it like a duck to water. The kid will pick up food off the sidewalk and eat it, but all of a sudden now he’s questioning the cleanliness of his kiddie toilet? 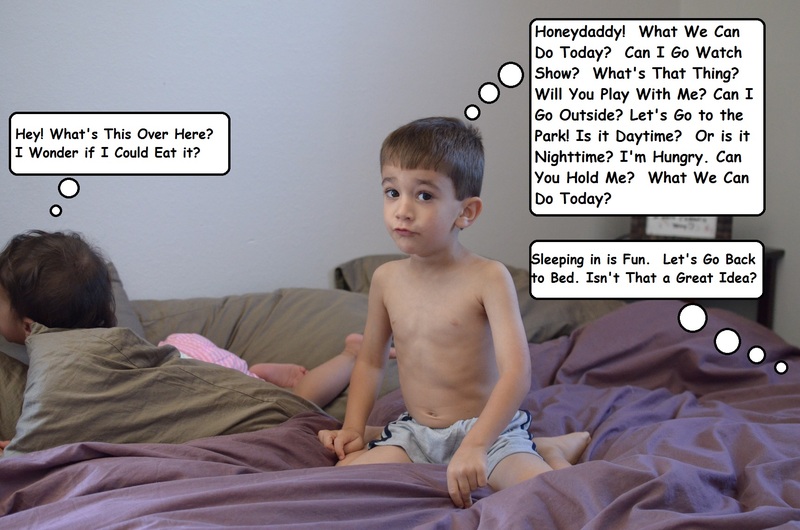 Toddlers and rational thought seldom collide. I crossed my fingers that not a drop of his body fluids would fall on the floor…for the next 2 hours. All in all, it was a very good learning experience for both of us…well, mainly for me. I didn’t pressure him to use the potty. I gave him the choice to pee in the warm, safe, comfy, clean, lovely, free-lollipop-dispensing potty or pee in the cold, drab, spider-infested, boogie-man-lurking corner. The choice was easy for him to make. Too bad his desire left after the sun went down. Come On Worm! You Can Doooo Doooo it!